Theatre Is Easy | Reviews | Solstice Party! The company of Solstice Party! BOTTOM LINE: An impeccably designed solstice party (!) under the stars that proves to be more than some millennials in search of themselves have bargained for. 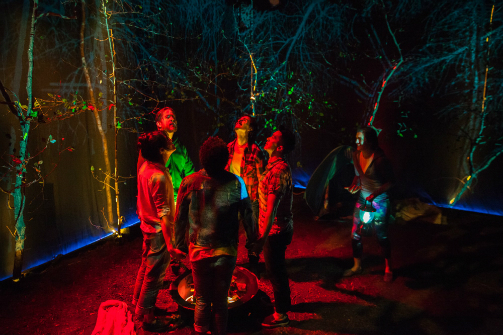 The remarkable design that is the hallmark of Live Source Theatre Group is on full display as you walk into the woods of Bryce Cutler’s set. Kevan Loney's subtle projections of swaying trees and Adrian Bridges' aural landscapes command us to a forest far upstate for a dinner party of farm-grown vegetables and roast pig in honor of the solstice. It's the kind of place where "the train doesn’t stop on weekends during the summer" and there are "no buses till morning." Pipi and Andrew (Phoebe Dunn and Chris Ignacio, respectively) have just made the drive up for some escapism under the trees. They meet the eccentric Dominique and Jo Ann (Patrick Andrew Jones and Satomi Blair), the perfect match of hipster farmers making things happen on their own patch of land. Then there is Stan (Michael Vitaly Sazonov), the more mysterious but also more relatable one to whom Pipi, who is growing skeptical, becomes attracted. Tyler Mercer guides this cast through a nuanced world of Susan Soon He Stanton’s creation, overseeing a methodical production that descends from the ordinary into the bizarre. With this descent, Loney’s projections take us down the rabbit hole of the surreal—a clock projects the time of the evening, in military time, as if a bomb is about to explode. We learn that these woods border on the compound of a rather ugly cult run by Peggy, who we will only meet briefly in Loney’s video design later. Stanton’s play is a remarkable character study of a group of millennials trying to make it work upstate. We know all of these people. They’ve moved out of Brooklyn because they “just can’t” anymore. There are rows of pickles in their kitchen, and not one of them is a cucumber. And the ability to see the stars at night equates to a wisdom of the universe that is much more insular than it is practical. While these archetypes are clear, Stanton straddles the line of irony delicately, firmly grounding them in the real. Her play unfolds slowly and methodically as Pipi learns more about these woods, details of which would be spoiled if offered here. This is a play about people looking to escape and to find themselves. But sometimes what they find leaves them scared, empty, and looking for the nearest bus. Jo Ann’s words earlier ring in our ears—“no buses till morning.” As harsh truths are revealed, Stanton gives us such gems of dialogue as “Empty space has more energy than everything in the universe combined. You cannot take away something and leave nothing.” It’s these rewarded poetic moments by Stanton, along with the songs by Adrian Bridges, that make this work most impressive. But Solstice Party! also feels too empty. There is something in that empty space, but Mercer offers this to us far too slowly, stringing us along in anticipation of a moment that never comes. It’s that slow pace that makes Solstice Party! less of a success. The design looms with impending doom, that clock ticking down the minutes toward destruction. When the bomb drops, it’s not earned or particularly interesting. All along this has been a kind of hipster Get Out, yet with stakes that don’t feel real. The company bills this play rather compellingly as a “Jonestown parable for the Trump era.” If we’re to believe that, we need more inside the emptiness. Solstice Party! is by Susan Soon He Stanton. Directed by Tyler Mercer. Scenic Design by Bryce Cutler. Costume Design by Angela Harner. Lighting Design by Mary Ellen Stebbins. Projection Design by Kevan Loney. Sound Design and Original Music by Adrian Bridges. Production Stage Manager is Jamie Rose Bukowski. The cast is Satomi Blair, Phoebe Dunn, Hallie Hadara, Chris Ignacio, Patrick Andrew Jones, Michael Vitaly Sazonov, and Stephanie Weeks.